Austin Hedges and Eric Hosmer both hit their first home runs of the season, and the Padres showed great discipline to the tune of 10 walks as they took down the Cardinals 6-4 on Saturday afternoon. Hunter Renfroe earned the start today and immediately repaid Andy Green’s faith in him. After Eric Hosmer walked and Manny Machado singled advancing Hosmer to third, Renfroe calmly strode to the plate and demolished a double down the left field line at 110.2 mph scoring Hosmer, giving the Padres a 1-0 lead. St. Louis starter Michael Wacha walked batters all afternoon, eight in all, but the Padres could not capitalize. In the first two innings alone, he gave up four walks but worked his way out of jams in both innings to keep the game at 1-0. 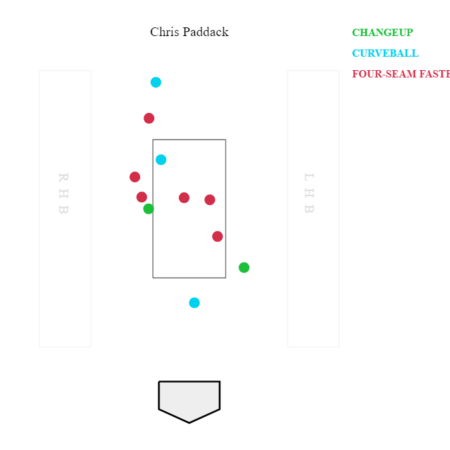 Chris Paddack also had to work for outs in this game. The rookie right-hander threw 50 pitches through the first two innings, including prolonged at-bats to Kolton Wong and Harrison Bader. He was not helped by an Ian Kinsler error, where a ball skipped under his glove at second base, which eventually leads to Wong hitting a sacrifice fly scoring Molina to tie the game at one apiece. Paddack came back with an 11-pitch third inning, impressively sending down the top of the Cardinals order 1-2-3. Throughout the inning, Paddack used a curveball three times, while in his first 50 pitches he threw one total. That’s interesting, because he exclusively used a fastball/changeup combination the first time through the order, and Paddack knew he had to mix things up in the third, especially against the likes of Matt Carpenter, Paul Goldschmidt, and Paul DeJong. Unfortunately for Paddack, he wasn’t able to replicate his third inning success in the fourth. He made it through two-thirds of the inning before he walked two batters and was relieved by Robert Stock after throwing a total of 89 pitches, 56 for strikes. Paddack struggled with his command, and against major league caliber hitters, he will find it harder to miss bats as he did in the minors. Stock entered the game with two outs in the third and immediately struggled with his command, walking the first batter he faced before ending the inning. The Padres bats remained quiet with a 1-2-3 inning in the top half of the fifth, and Stock retook the mound for the bottom half. Matt Carpenter leads off with a single, followed by a fly out and a strikeout by Stock. But with two outs and a full count, Stock threw a slider that was supposed to be on the outside corner and missed his spot and left it over the plate. Marcell Ozuna punished Stock’s mistake and sent the ball 455 feet into the second deck in left field, giving the Cardinals a 3-1 lead. Fast forward to the top of the seventh, where Eric Hosmer hit his first home run of the season, an opposite-field shot to the left field bleachers. Surprisingly, Hosmer’s launch angle was 27 degrees, allowing the ball to carry just over the wall in left field near the foul pole. Matt Wisler also made his Padres debut out of the pen, pitching two innings of scoreless ball to keep the Padres in the game. The bats finally came to life for the Padres in the eighth. 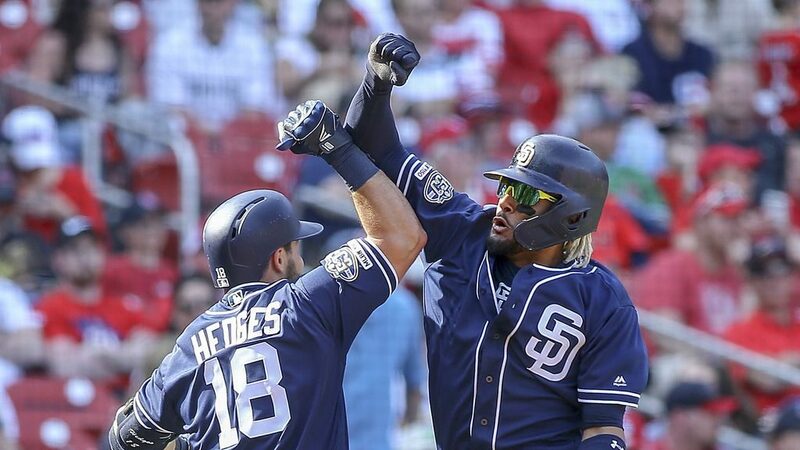 Fernando Tatis Jr. walked to lead off, and then Austin Hedges mashed a 3-2 pitch to deep left-center into the Padres bullpen for his first home run of the year, giving the Padres a 4-3 lead. Then after Ian Kinsler got on base, Manny Machado deposited his second home run of the season over the wall in left field to give the Padres some insurance runs and a 6-3 lead. Machado’s home run was tracked at 109.9 mph, while Hedges was tracked at 107.6 mph. The Cardinals were able to score a run in the bottom of the eighth, but eventually, Craig Stammen was able to work himself out of a jam by striking out Carpenter and getting Goldschmidt to groundout. The game entered the ninth with the Padres up 6-4, and after the Friars went down quietly in the top half, Kirby Yates came in to slam the door for the Padres. 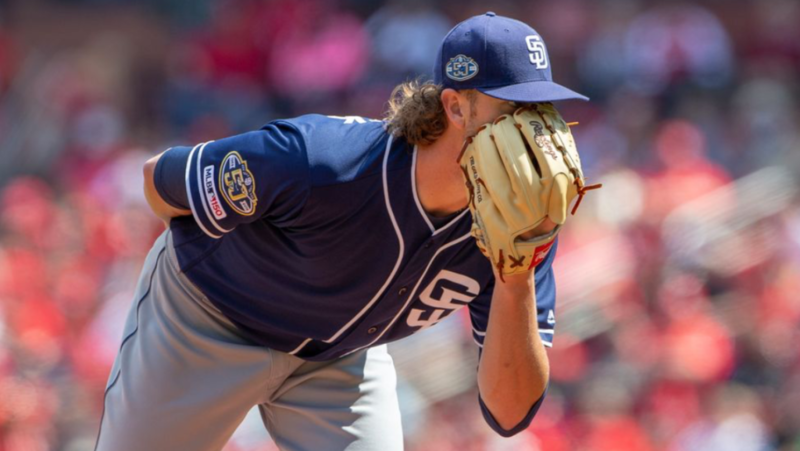 The Padres have clinched the series and will go for the sweep tomorrow as Matt Strahm will look to put together a better outing than his first of the year, as he goes up against Adam Wainwright. Previous Does Mejia’s Pitch Framing Hurt Padres?